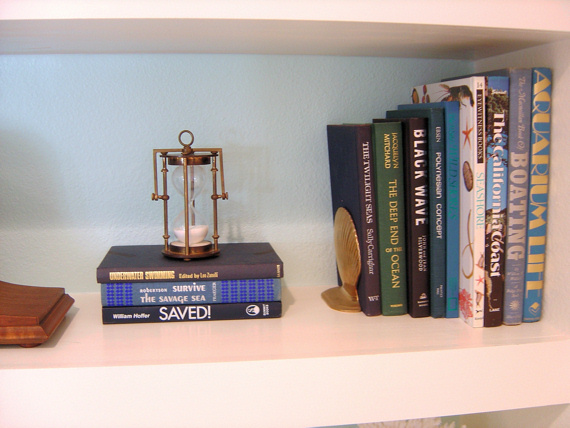 Have you ever had an area in your home that was well, odd? When we bought our little home by the beach last year we had just that! 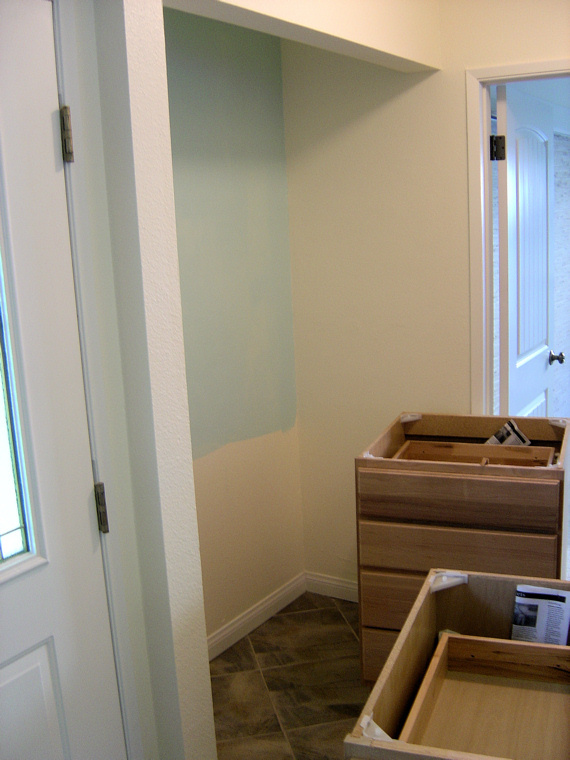 Upon entering the front door and off to the left there was what we believed to be a closet at one time. No doors were present but we were pretty sure that it was once used as a closet. Well after all the painting and everything else that was broken and fixed was done, it came down to just a few more tweeks of things that bothered us before we thru in the old "proverbial towel" of projects for the year. It just happened to be this little odd space. 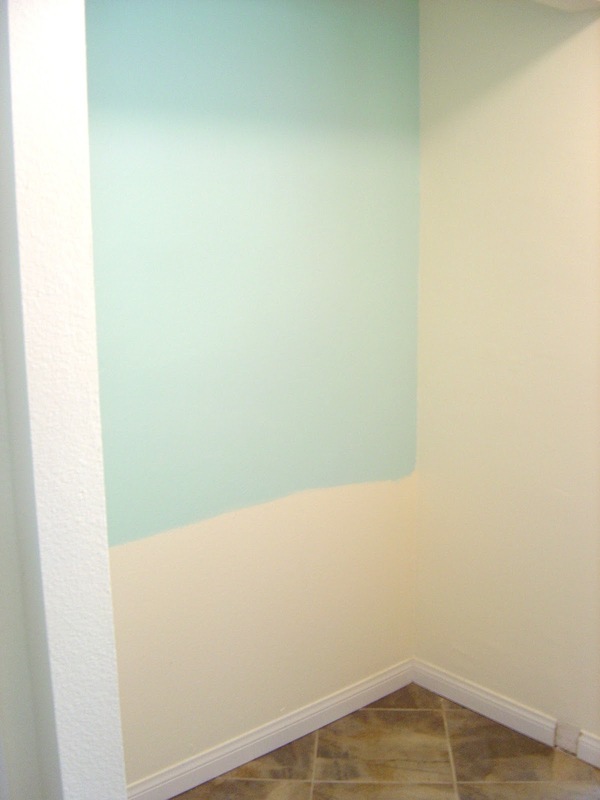 We knew it would no longer serve as a closet it was too valueable of interior real estate to do that. 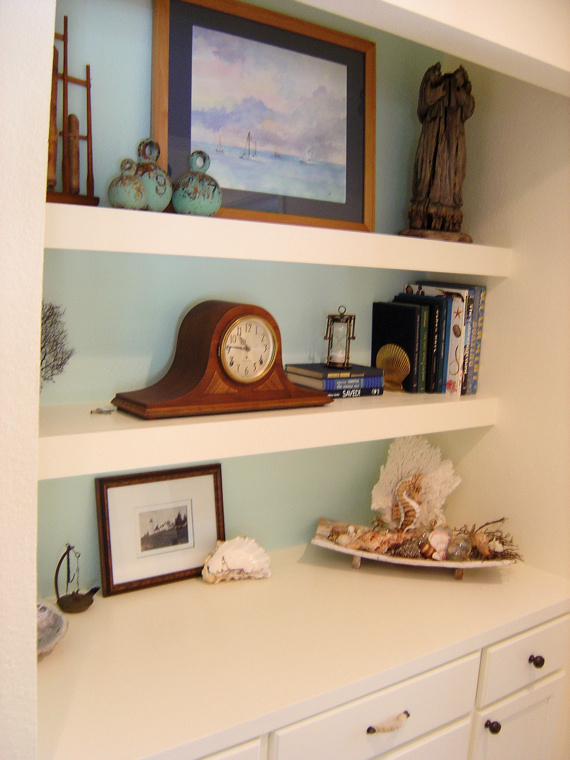 Instead we settled on storage, but it had to have shelves as well to display many of our nautical finds. Once again and on a shoestring budget I searched for pre-made cabinets that would fit into this space. Lo and behold Home Depot had what I wanted. 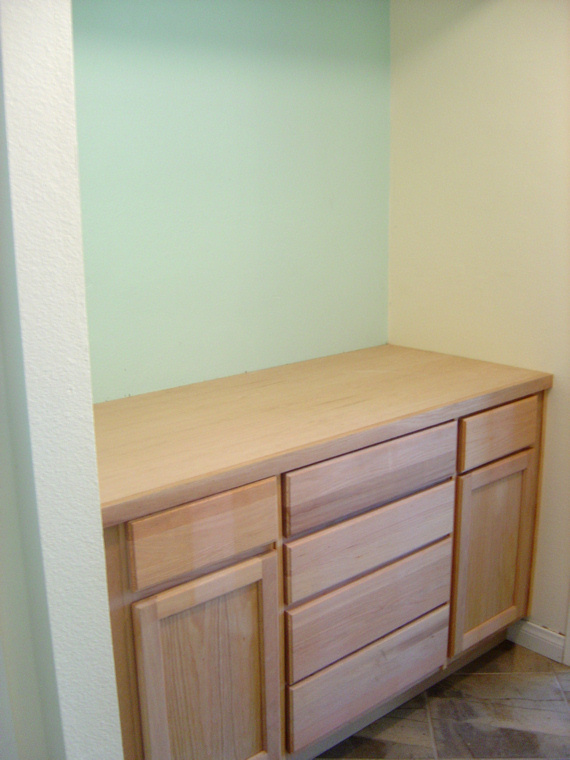 Two 15" side cabinets with drawers and one 34" cabinet with 4 drawers. I layed out my idea on paper and gave it to the boss, (hubby) who agreed to proceed! 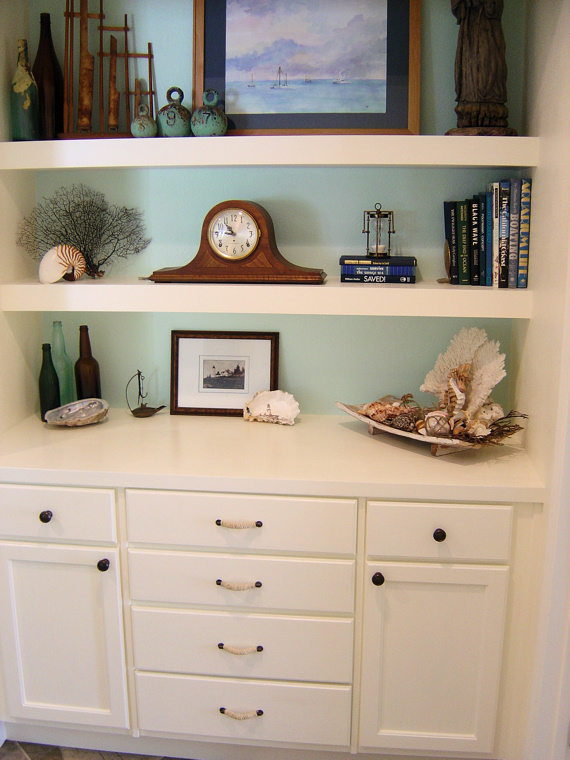 Since my husband has been very busy with his own job I searched out a local craftsmen that had the tools and know-how to set the cabinets in place for us and make floating shelves. 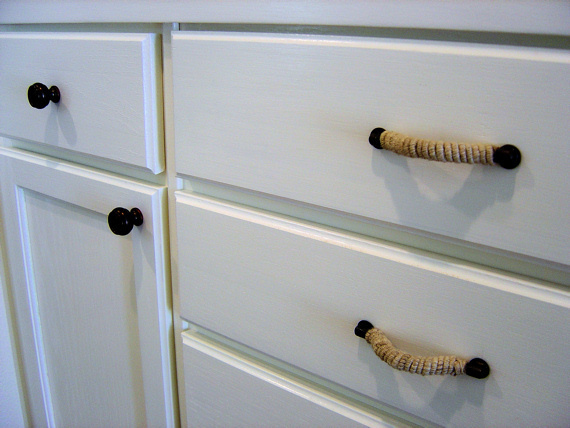 The painting, knobs, pulls and painting was all mine! Well, after sanding, priming and painting many coats of my favorite white paint by BEHR called Plantation White in a semi-gloss It was time to find the hardware. 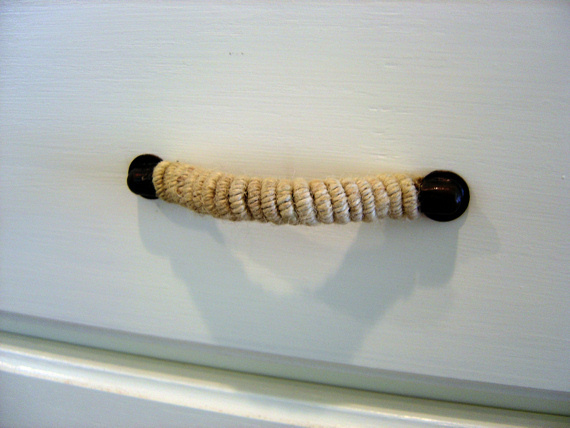 Last week I blogged about Nautical Hardware and came across a very unique pull handle from Anthropologie that I just knew would be perfect. 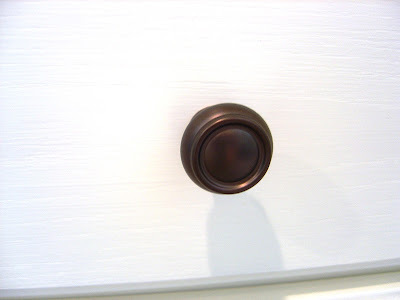 A bit pricey ($14 each) but totally worth it and paired with matching knobs I found at Lowes for a mere $3 each I marked all the holes and hubby put them on. We are so please with the end result we are absolutely giddy! Let me know what you think. The whole project came in at $830 including labor and all materials. Hope you like it because I know we do!!!!! Adding the pre-made cabinets, check! I am so sorry I forgot to take a pic of the shelves that followed. All done and absolutely to die for! 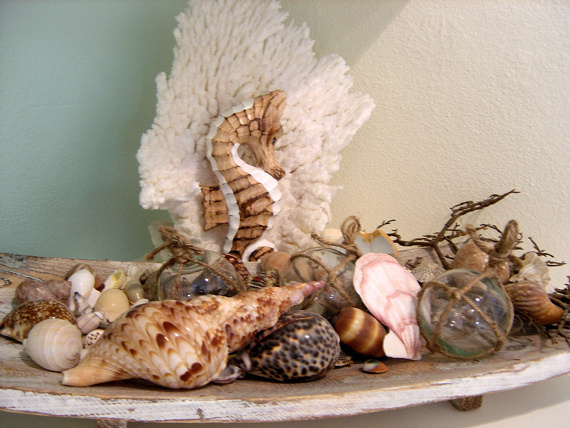 One of my favorites.......Seahorses and Seashells! Sharon, it's gorgeous! Looks like it was designed as an original space in the house. The background color is so peaceful and your decor is beautiful. P.S. Just an fyi ~ the word verification is still turned on. I've just verified the settings and the word verification is now disabled. Hopefully this will make commenting a bit easier for everyone.